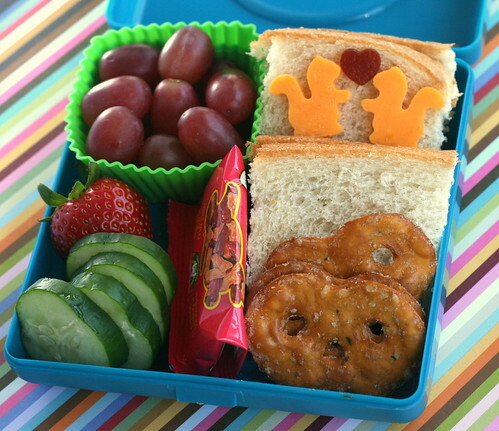 Cute little bento lunch for my three-year-old daughter - in a new box!! I've been eyeing these colorful sandwich boxes online forEVER! Seriously, it's been months. I just couldn't get a really good idea of size or depth on it at all to determine if it would be a good box for bento. Also, I have been trying really hard to cut back on the amount of lunch supplies I bring into the house. I just don't have the space. I have overflow. My cabinets runneth over. And over and over. Anyway, back to this box. I've been really really good at resisting the urge to order it online. And then one day I'm innocently pushing my shopping cart through the grocery store buying necessary food stuffs to feed my hungry family and I just so happen to be passing by this small display section that shelves some kitchen items and there I see The Box. I grabbed for it with such a lightning fast reflex that I actually startled my father who was shopping with me. And that was that. It came home with me. And it was soon joined by two three of its friends. So much for cutting back. Oops. What brand is the Box? Hi Melissa! So that is just the size of a typical sandwich box? You fit ALL that in there? Amazing. lol I have been holding off on buying any lunch size containers ( my son will only need one next year for K ) but this one might be too hard to resist! Astrid, on Amazon (where I first saw it and have drooled over it for months....) they call it "Everset Sandwich Box", but on the lid it just says "fuel". I'm not really sure! Kristine, it's a sandwich box size, and it separates right in the middle - so the lid stands up just as high as the bottom is deep (hope that makes sense). It's roomier than a typical sandwich box - those ones that are shaped like a slice of bread - but still really compact. :) I really like it! I have this box & LOVE it. I grabbed one at the grocery store at "back to school" time, and have been on the hunt for another ever since. Curious to know which store you were shopping at! Can you tell me the brand of the pretzel thins you have in today's (and yesterday's) lunch. I know Weight Watchers makes some, but if I can buy them somewhere besides in their meetings, I'd be in heaven! I use the lock and lock that has the four separate compartments. I have a terrible time judging size - is it like that size, just without compartments? I love your (very old now!) post describing box sizes and it encouraged me to buy this lock and lock box. The visual was great! Cute box! What I want to know is where the awesome squirrel cutters you've been showing lately are from (big and little)? The big squirrel I used yesterday is from a set of autumn themed cutters - there's also a couple leaves, a pumpkin (? ), apple (I think? ), acorn, turkey... it's a set by Fox Run. The pretzel thins are just Pretzel Thins brand, I think. That's all it says across the top of the bag. I got them at Publix and they are stocked in the produce section, not the regular chip/snack aisle. I hope that helps. They are fabulous! Kelly, I just checked this box vs. the 4 square Lock & Lock and they are very close to being exactly the same size. I can fit all 4 of those inner boxes into this box, with just a tiny gap on the side. They are the same height too, though you can't close this lid with the boxes in there. If you can see in this photo how the lid has an indent in it? That same indent appears on the bottom of the box too. Thanks! I will keep an eye out for them here on the west coast! I LOVE the Weight Watchers ones, but they are soooooooo expensive. I love those boxes! They are great containers and easy to open too. I love the squirrels and it's the perfect amount and variety of food for a three year old! Sorry for the confusion. I'll be making my next eye exam now.